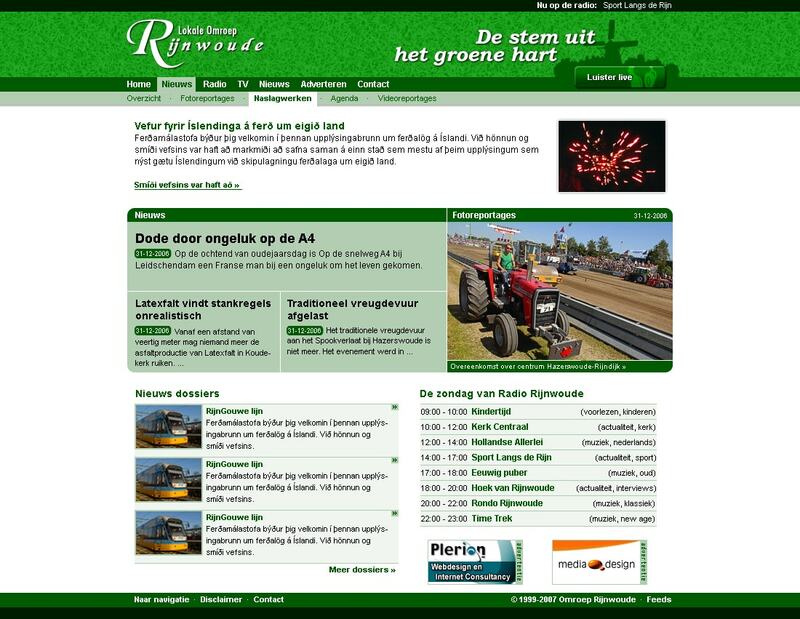 Today I launched the new website of Lokale Omroep Rijnwoude, after an extended period of development. The design is something I whipped up way back in 2005. Due to uninteresting circumstances, the project got shelved. The site was on a development server back then, and remained there until I rediscovered it two months ago. I proceeded to make a short list of things that needed to be added or changed, divided into tiny tasks, so it became easy to just fix something within 15 minutes, and scratch it off the list. A great way to work, if you don’t have lots of time each day to spend on it. Besides those, there were quite a few other minor issues and enhancements that got fixed. The website is now valid XHTML1.1 again (yes, with mimetype switching) , something I still find quite a feat for a website with over 5000 news articles. Even though Omroep Rijnwoude will most likely be merging with AlphenstadFM in the next three years, it feels good to have a proper, modern website that outclasses all other dutch local radio stations.